Commil developed a technology that allows people to use wireless phones on inexpensive local wireless networks as well as to connect phones and computers to the Internet and other communications networks. Rather than to have to use expensive cellular minutes every time you need to make a call, you can make wireless calls using Wi-Fi or Bluetooth when you are in a building, for example, by simply connecting to other phones and the Internet through the building's wireless network. Commil's technology not only makes it possible to move from one wireless network to another, as a person moves from one network to another, it also allows the user to do so without experiencing an interruption to the call. Imagine using your cell phone without using your cell phone minutes whenever you are at home or in a building with a wireless network to which you have access; Commil technology makes that dream a reality. Using the Commil patent and its claimed wireless architecture, one then needs only to choose which local network to connect to using their phone or laptop. 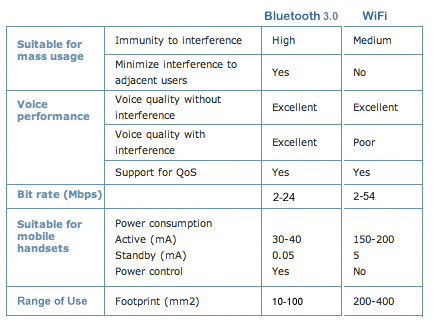 The following comparison discusses the advantages and disadvantages of Wi-Fi and Bluetooth. For more information on these terms, visit our glossary page. While radio and television (before the digital conversion) broadcast on specific licensed frequencies, many wireless devices operate in the same spectrum and as a result they can experience some interference. The right wireless technology should be able to thrive even in the presence of interference. The average office / home setting has a variety of devices operating in the same spectrum including Wi-Fi networks, cordless / cellular phones, headsets and other wireless devices - such as printers, video games, gate openers, etc. 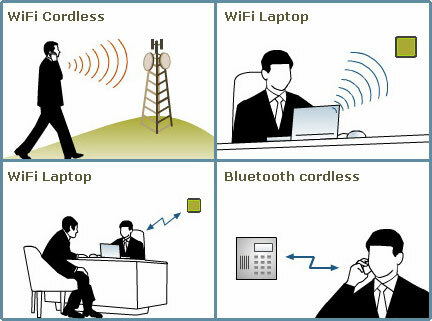 The wireless technology should also be suitable for mass market implementation. The Wi-Fi and Bluetooth formats have their own advantages and disadvantages. While Bluetooth experiences less interference and uses less power, Wi-Fi can handle faster data transmission speeds and has been adopted by a broader range of commercial applications.